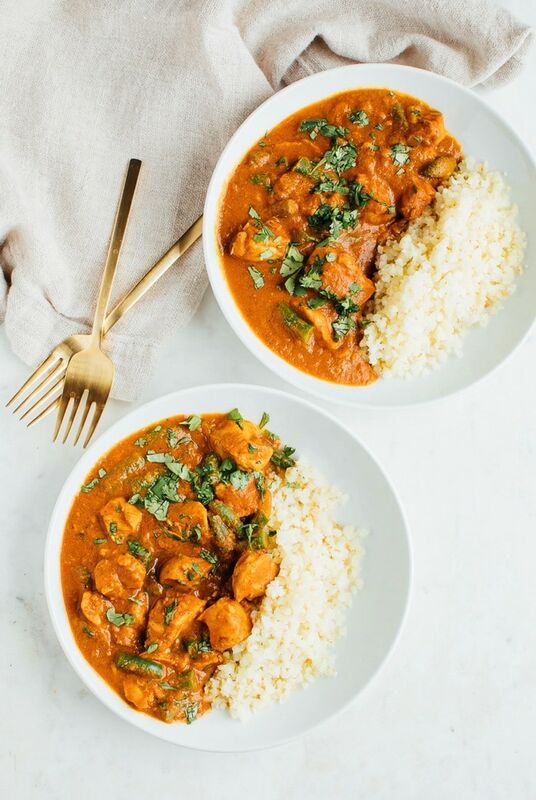 A lightened up version of an Indian food classic, you’ll love this slow cooker dairy-free butter chicken recipe made with coconut oil and coconut milk. 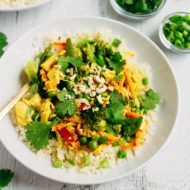 It’s loaded with flavor and absolutely delicious served over cauliflower rice. Paleo, grain-free and dairy-free. This post is sponsored by Nature’s Way. In case you haven’t noticed, we LOVE Indian food over here! I basically add curry to everything. Prime example = my curried shakshuka. 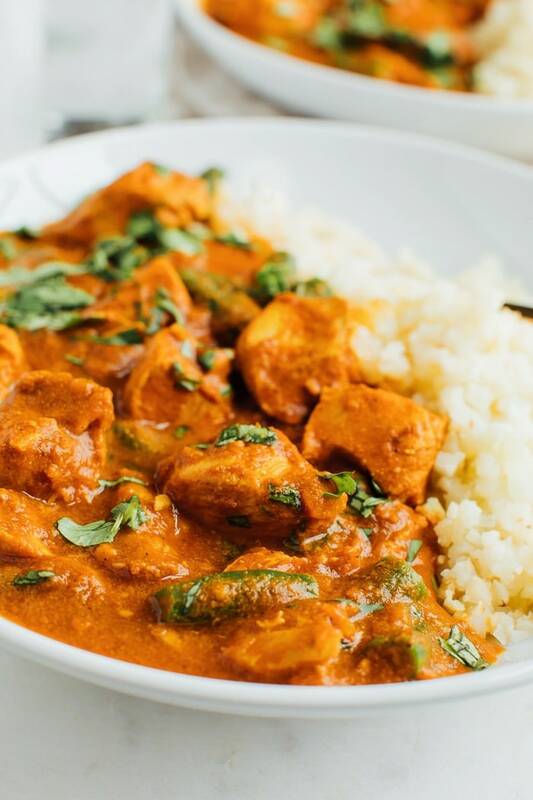 Anyhow, one of Isaac’s favorite Indian dishes is butter chicken, which isn’t the healthiest of options when it comes to Indian food. Honestly, most Indian food can feel kind of heavy, with rich sauces, lots of rice and naan. Don’t get me wrong, I love all of this and enjoy it very much when we go out for Indian, but I also like being able to make and enjoy a lighter version at home on the regular. Side note: we have an awesome Indian restaurant in Richmond called Lehja that actually makes really clean Indian cuisine. They’ll even make things vegan if you request it. With that in mind I set out to make an at-home version of butter chicken with really clean ingredients. 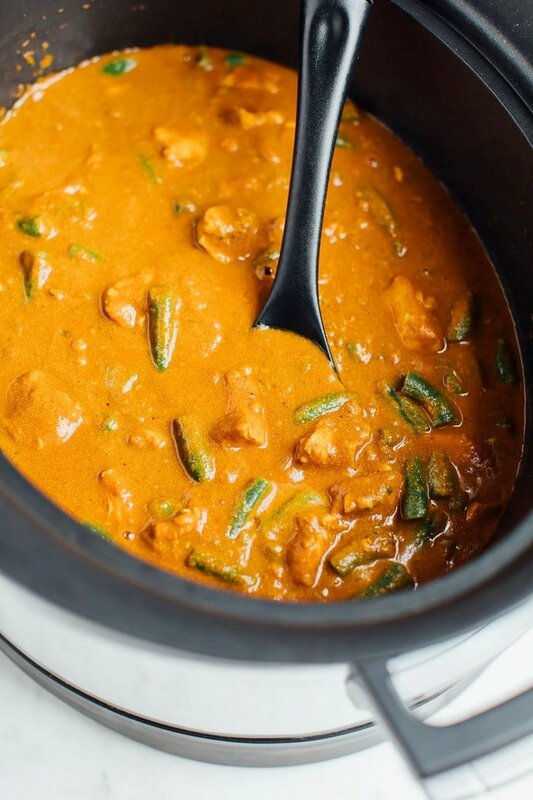 Don’t let the name fool ya, this butter chicken doesn’t have any butter. We’re using Nature’s Way Organic Extra Virgin Coconut Oil instead and it works like a charm. 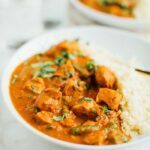 In traditional butter chicken recipes the chicken is marinated in a yogurt mixture, but I wanted this recipe to be 100% dairy-free so we’re using coconut milk and skipping the marinating process altogether. Don’t worry, cooking in slow cooker ensures the meat has plenty of time to soak up lots of flavor from the tomato sauce. Nature’s Way Coconut Oil replaces the butter, but provides the same robust richness. It also works perfectly for sautéing the onion, garlic and ginger before placing everything in the slow cooker. Although butter chicken isn’t traditionally cooked with veggies I took it upon myself to add green beans to my version. Not only do they add another texture and some volume, you’re also getting a pop of color and additional nutrients. 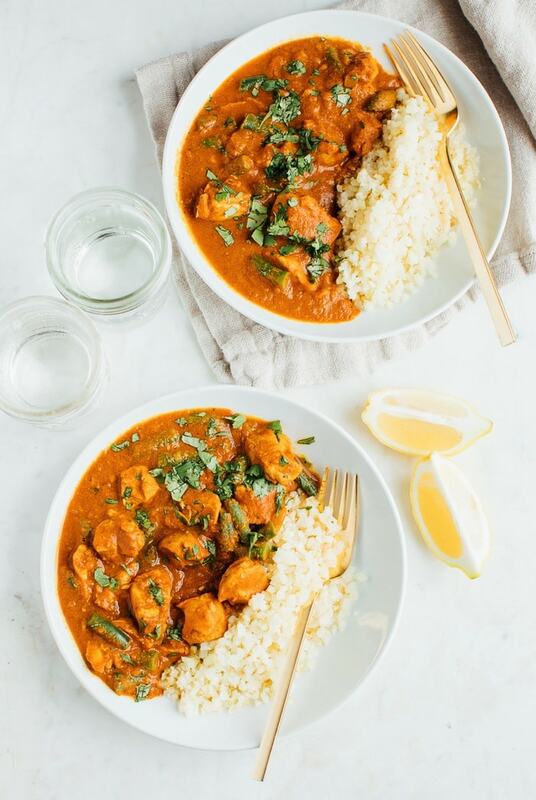 Isaac and I loved the way this dairy-free butter chicken turned out. Not only did the kitchen smell amazing while the chicken cooked away in the slow cooker, but we enjoyed this dish for dinner three nights in a row and each night was better than the next. I loved having it over cauliflower rice with a heavy sprinkle of chopped cilantro and a squeeze of lime. It was so delicious I almost didn’t miss the naan…. almost. In terms of spice level this butter chicken isn’t super spicy, but there is a bit cayenne pepper. You can leave this out if you want a milder dish or add more for extra spice. 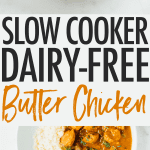 If you make this slow cooker dairy-free butter chicken let me know how it turns out by leaving comment and star rating below. 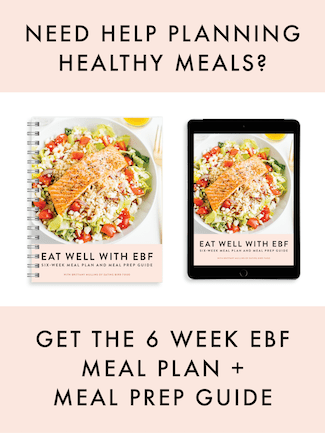 Your feedback is super helpful for the EBF team and other readers. 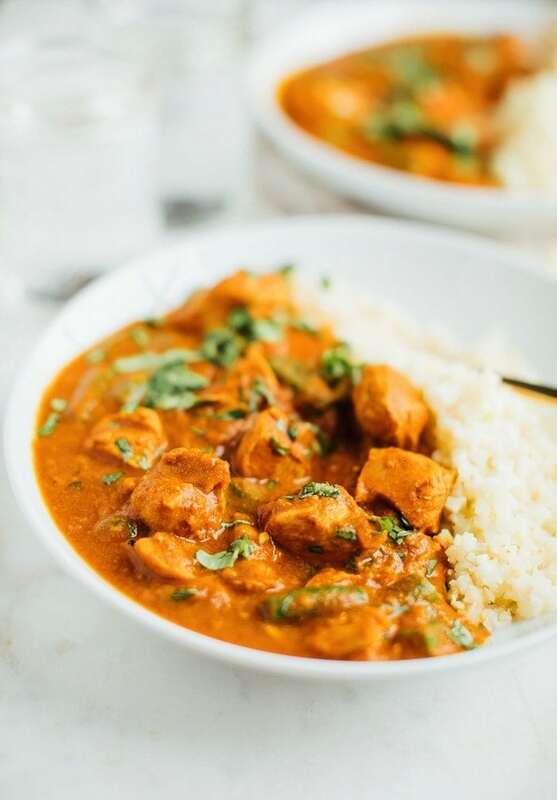 A lightened up version of an Indian food classic, you’ll love this slow cooker dairy-free butter chicken recipe made with coconut oil and coconut milk. Transfer onion and garlic mixture into your slow cooker. Add chicken, coconut milk, tomato sauce, lemon juice and cinnamon stick to the slow cooker as well. Cover and cook on high for 3 hours or low for 6 hours. Add green beans when there’s about 1 hour left in the cooking process. Serve over cauliflower rice (or regular rice) with fresh cilantro and a wedge of lemon for squeezing. This looks great. I will try it this weekend, thanks! Looks delicious! 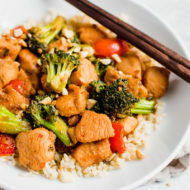 Has anyone tried making this with tofu instead of chicken? Not yet, but I think it would work out great with firm or extra firm tofu. I also have this amazing mattar tofu if you’re looking for an Indian dish with tofu. This recipe is fantastic! I followed it as written but also added a head of chopped kale along with the green beans. My batch did not need 6 hours on low–more like 4.5 to 5–I believe because the chicken was cut up into pieces and with the ease of using frozen green beans. Along with the cauliflower rice, it is satisfying but light. Will definitely make it again. Hi Angela! I’m so glad that you enjoyed this recipe and I so appreciate you taking the time to come back and leave this comment as well. I love your addition of chopped kale. I’m all about adding extra leafy greens to everything! Hi, I’m thinking of buying a slow cocker and wanted to ask you for some advice before getting one. I have a pressure cooker, not a slow cooker, any idea how long to cook? I’m thinking you’d probably just use the meat setting on your pressure cooker, which is likely about 15-20 minutes. I have a pressure cooker too so I should try the recipe in it! Looks super yummy! 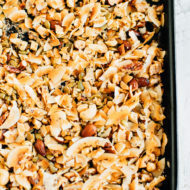 I have some light coconut milk on hand, do you think that could work in this recipe? Just curious what a can of tomato sauce is ? Just like a can of crushed tomatoes or something thicker like paste ? We love Lehja….we usually eat there 2-3 time a month. I would love to figure out how to make their Crab-Scallop “MelJol”. We also love their House Kabab Medley. Uh, is there an error in the ingredient list? 15 cans each of tomato sauce and coconut milk? Never mind. Haha. I missed the “oz” part. This was simply delicious and had the whole family wanting more! My toddler can’t do dairy, nut or gluten therefore this dish was perfect for him. My 8 year old had seconds and thirds, we’ll my husband and I did too 🙂 Instead of adding green beans into the butter chicken, I sauteed them with olive oil, garlic and salt & pepper and served it as a side dish. Thank you for this recipe! Can’t wait to have people over, to make this intoxicating dish again and again. Thanks for the recipe. My daughter has a dairy allergy so this is wonderful. It’s always nice when she can try different ethnic foods. Hi, this looks great! Can i use fresh tomatoes instead? This was phenomenal!!! Literally tasted exactly like the real thing if not better and so much healthier. Can’t wait for your E-Book! Can I prepare this the nite before and cook the following day? Could this be adapted for shrimp? I forgot the cinnamon stick, but it was still delicious! Thanks for the recipe! Hi, This looks delicious. However, I cannot use coconut milk. It makes me nauseous. I drink Cashew milk and use that in recipes. Would that work in this? 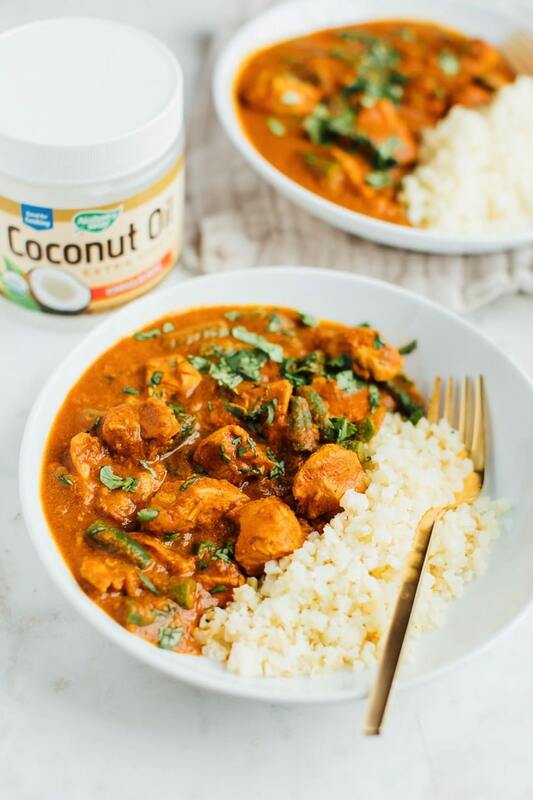 I love Butter Chicken but almost every recipe calls for coconut milk (I guess because it is an Indian dish). Any suggestions? Made this today for a comforting Sunday dinner. Turned out incredible!! Thank you so much for this recipe. Tweaked the recipe ever so slightly. I added cayenne powder and about a tsp. of ground cardamom. I also added a decent size handful of fresh cilantro with everything in the crockpot, not at the end. Delicious!! Thank you for sharing this delicious recipe! I made it in the slow cooker for 3.5 hours on high, and substituted the chicken breasts with chicken thighs. I made this over the weekend and it was delicious! I didn’t do it in the slow cooker as was short on time so I’m sure it could have been even nicer! This recipe is amazing! I was lazy and used garlic, onion and ginger powder instead of the real thing. Just threw everything in the slowcooker and done! So yum.